Rafael Nadal strides up the stairs, eager to know if the menu of pasta and Coca-Cola offered by the restaurant for less than 10 euros satisfies his hunger. The champion is at the door of the club where he took his first steps in tennis. 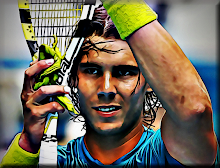 "Nadal, the momentum of Manacor," he reads. The posters loan titles in Majorcan live with unexpected symbols. In the Parc des Avinguda, right where the temple of Nadal, pedestrians can cross with that proud look in his chest two letters are a challenge: RF, the initials of Switzerland's Roger Federer. So things happen. It is December 1, and the general rules the winter and Peninsula. In Manacor, however, the sun heats the conversation and memories of the player. Nadal grew up watching the sea. When you can, live treading sand on the beach, water, sea, or grass, while playing golf or football with his friends, who have made federal tab for Inter Manacor, Third Regional. Mallorca is the sun. Nadal, too. "I curse you always had the idea to change the time!" Fun. "I go crazy. Good lord," continued the Spaniard, which was altered by a pre-season shoulder injury, suffered during the Davis Cup final. "With friends, in a city, at three in the afternoon, you can not organize a game of racquetball or indoor soccer. Do not get it. Here, there are no problems. Same with golf, especially in hot weather, you can play until 19.00. So curse that had the idea to change the time! Improvise here is easier. I have nothing to hide. I did not ask whether or not I am player " he continues. "I do not think people taking three or four sites could understand why Manacor is so special to me, although there are many more than four or five sites here that are beautiful," he adds. "It's the way I have organized life. As an island, no facility to see the people you love. A time to see the family, we are within a radius of three kilometers and many live on top of each other [in an apartment block]. " "Music is not my thing," laughs Nadal. "I like to listen, but I'm a mess. Only played in music classes at school and my teachers know that it was not my thing. Nothing," he adds. "From my grandfather I admire his enthusiasm for it. I am a pretty passionate guy at all, which is involved in everything he does. My grandfather is a superfan of music, at any time. It gives life. It is a machine work on that. is a person who always likes to keep learning, keep studying things ... The whole life. " That is Nadal. Continue to learn things in preparation for the assault on 2012. Away from the dirt tracks that saw him take his first steps, practice in a modern concrete runways. They used hard to recover their identity. There and in the gym, Forcades Joan, his trainer, he works the body and mind, because there is no explanation exercise, work that lacks behind an idea. There, in Mallorca, he continues to serve Maymó Rafael, his physical therapist. And there, under the command of Toni, his uncle and trainer, Nadal prepares to come: an Olympic year full of challenges and emotions.